The Mandalorian Warrior in the FanFic I'm working on has black armor to symbolize justice with a gold visor T to symbolize vengence and a blood red Mythosaur skull on the left shoulder. The layout of the armor is like Canderous Ordo's. Black and gold are the same colors my guys got.....good taste. Same order, too. Thanks, and to keep it from being too plain I put it over a dark gray flight suit. Nice stuff, Orthar. I have to say, I like yours better than the others. They're all nice though. I hadn't even thought about a flight suit. I don't think the black and gold scheme is too plain. "In simplicity there is both clarity and strength." Thats the final straw! I here by offically announce my comitment to creating my beskar'gam. I can't live my life lusting after it only. Orthar, your kote mandos know how to get around the girl problems correct? Sweetness. I wonder how'd look in armor. I doubt as cool as you guys though. you would probably look cooler! has anyone see the videos of the guy making his mando armor on youtube? What types are your guys' armor? Mine is super commando. Not sure on your meaning there vod, ALL Boba/Jango era Mandalorian armour is based on the same (basic) design, although modification and variation does exist. Supercommando's are the best of the best Mandalorians, elite if you like. Shocktrooper's on the other hand was a name that applied to all Mandalorians of Boba and Jango's era (originally having come from the Neo-Crusaders name of a type of Mandalorian soldier 5000 yrs before Star Wars ANH). It would there-fore be more accurate to say that the armour is Shocktrooper armour. 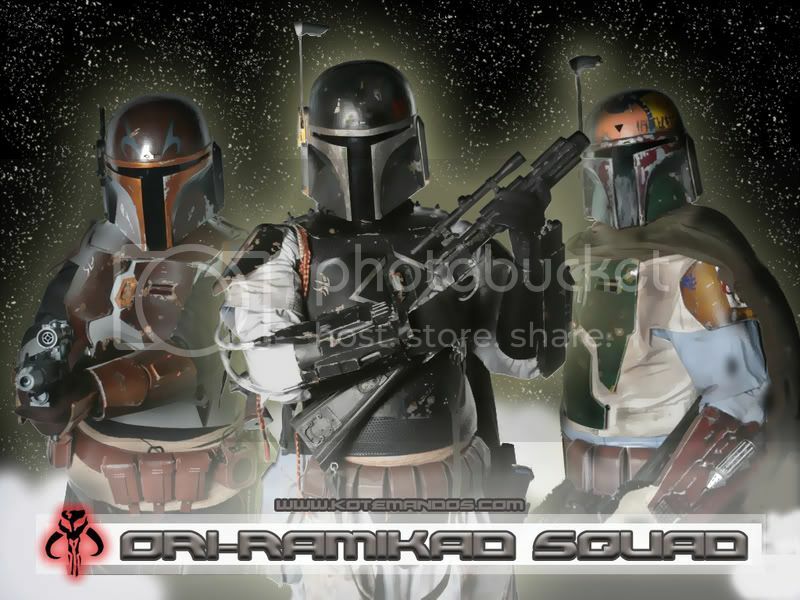 KOTE Mandos are also referred to as Ori'ramikad Squad - which is Mando'a for Supercommando Squad, so we are also Supercommando's. I looked up the supercommando armor on wookieepedia and the pic there looks more like Neo-Crusader armor so I'll put it this way; my armor is like Canderous Ordo's, a little bulkier and covers more parts of the body. Almost like a cross between Neo-Crusader and Shock Trooper armor. I get what you're saying though, but I was refering more to armor styles. There's only Two really different versions of the armor that I know of: The Neo-Crusader armor as seen in KotOR and the Fett style; but only the Neo-Crusader armor was standardized. Even in that era 5000 years before Ep. IV, there was GREAT diversity in Mando armor; even more then 'Modern' Mando armor that I've seen. Just look up the KotOR comics and you'll see MASSIVE variations and diversity in the armor. Only the Neo-Crusader armor from the game was wide spread, and even it had variations that you never see in the game. In reality, I'm not sure there's any ONE thing about Mando armor that can really be called 'standard' and common off all. A Mandalorian's armor is really a personal thing, and can very Dramatically from one warrior to the next. The T-visor is VERY common, even in the KotOR era, but isn't on all Mandos. Neither is the full body coverage, as some were sleeveless, or in the case of a Twilek I saw, his 'head tails' were exposed and hung from holes on the sides of his helmet. Si, you should definitly get armor! I've read lots of stuff on making my own armor, but none of it makes sense to me. I'm shooting for skiff guard-like armor, but I want to be able to put a long tunic beneath it and a headscarf, and tranform into a Haradrim from Lord of the Rings. Two armors in one! How do I do it? Will I have to just hammer out the metals? 1. The wearer was always protected by lightsaber-resistant Mandalorian iron, which could also deflect blaster bolts. 2. The helmets almost always possessed a T-shaped visor and a sophisticated heads-up display (HUD). 3. Mandalorian warriors decorated their armor to reflect personal accomplishments, clan affiliation, or simply personal preference. They often repainted their armor to reflect rank, clan, and possibly the current terrain. They were also known to paint their armor in the traditional colors that represented specific causes the individual might currently be undertaking. The color blue represented reliability, green for duty, black for justice, gold for vengeance, red for honoring a father, and gray for mourning a lost love were common color variants. The colors, however, did not always have a specific meaning. Sometimes they were just colors that the particular Mandalorian liked. Some Mandalorians wore pieces of armor to honor relatives, both dead and alive. Though I know that a lot of mandos didn't use Mandalorian Iron for their Beskar' gam I thought that the T visor was always consistent, even with defectors like the Death Watch. I think that black with silver would look very cool! Same, that's a Very nice combination. Interesting piece of information, I would like to take note of that. I liked the color scheme of Boba Fett's armor does the red on his T-shape visor honor Jaster or Jango or Both? Well, if you read everything there, you basiclly come away with my statement... there was NO standard version of the armor. 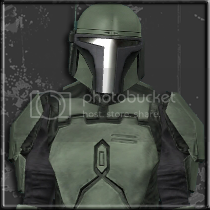 In 1., you stated that the wearer ALWAYS was protected by Mandalorian Iron, then admited that this was on the case in 3. As you admit in #2, the helmet ALMOST always possessed the T-visor; I know for a fact that this is true, and that during the Mandalorian Wars era the T-visor wasn't all that common at all. And in #3 you basically say what I did again: each Mando painted and decorated his/her armor to their own personal tastes and there was NO commonality. I hadn't heard that many Mandos painted their armor for other reasons then the 'color code,' and I'm very glad if that's true. I'm not saying we disagree I was simply pointing something out. And like I said those three points were copy and pasted directly from Wookiepedia, they weren't my own. I personally have never seen a Mando without a T visor though. Also, I don't think that the color of the armor determines the type. Ahhhhh, I missed your note that the text there was copied from the Wiki. As I'm sure Draco would have pointed out if he'd seen that, you should trust NOTHING you see there. I follow it to a degree, but he's basically right; it can be VERY missleading, and not as accurate as it might sound. Look up pics from the KotOR comics with groups of Mandos, or play the KotOR games. EVERY Mando except Mandalore Ordo you see in the games does Not have a T-visor, but rather an Imperial Guard lookin' slit visor. In the comics, most DO have some sort of T-visor, but not all. And there's a ton of variations on the T for those who do. True about Wookieepedia, and I wonder if modern Mandos having shock trooper armor is due to their creators basically copying the Boba and Jango armor, giving it a different color and the person inside a different name. I'm very sure it is... which is very sad.